SuperBot has revealed a pair of new characters for upcoming Vita beat 'em up PlayStation All-Stars Battle Royale. 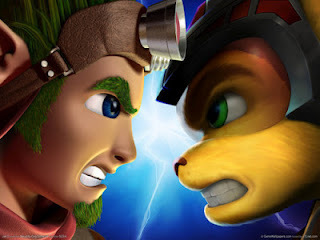 At Comic-Con, the developer announced that the Smash Bros-style fighter will feature Jak and Daxter (as a single contestant) and Cole MacGrath. Cole is a bike messenger who is turned into an electrically-charged superhero when he's caught in the blast radius of an EMP bomb. He starred in PS3 adventure game inFamous and its sequel. Jak and Daxter are stars of the PlayStation 2 franchise of the same name - developed by Uncharted-maker Naughty Dog. They fight as one character, with sidekick Daxter riding on Jak's shoulders (and helping out in close quarters combat). Jak's got an arsenal of weaponry to play with - including the Blaster, Needle Lazer, Gyro Burster, and Mass Inverter. His special transformations turn him into Dark or Light Jak (From Jak II: Renegade and Jak 3), which greatly boost his powers. Let us know what characters you want to see in the game in the comments below!